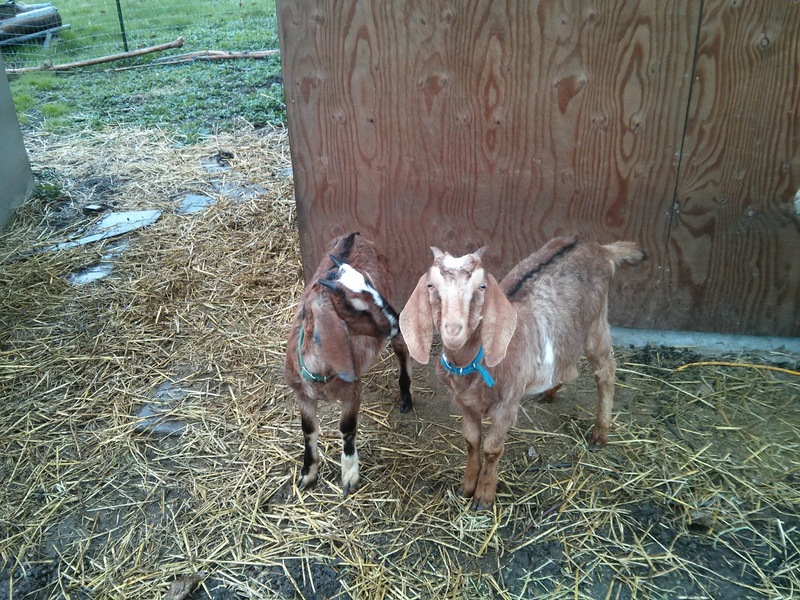 We have had milk goats on our (Zwicker) property for a few years now. As they made progress clearing out all the bushes and young trees I began putting thought to future grazing options. 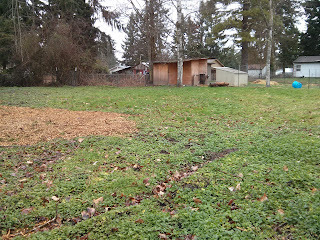 Since goats are browsers and interested in bushes and trees rather than grazers which are interested in grasses I either need to begin growing the sorts of things that provide high protein roughage that mimic bushy nutrients or spend ever more money on alfalfa which is getting more expensive every year. Now is the time to get started. Actually, last fall was the time to get started but we'll get to that later. Last year at the Mother Earth News Fair in Puyallup I attended a basic pasture management lecture which gave me lots of ideas on seeding methods, rotations, and fencing layouts. I bought a pasture seed mixture especially formulated for milk producers and a clover and vetch mixture to supplement. Since it is a relatively small pasture I planned to hand-cast the seeds rather than buy machinery. I also don't have the machinery to rough up the top inch of grass and make it more amenable to seeds so the idea was to top seed by hand in the fall and cover the seeds with a very fine cover of wood chips to hide most of them from the birds. Sowing in the Fall allows the new seeds to root and sprout while the grass is dormant which gives it a head start in the spring. Unfortunately, the combination of life circumstances and lack of wood chips prevented the ideal situation. So, instead, we're doing all this in the spring. 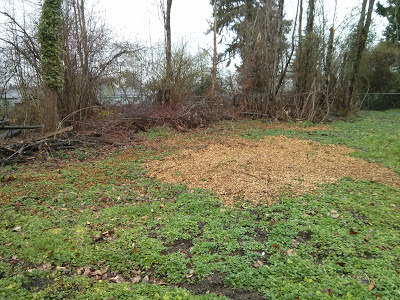 First we had to chop up two trees that fell over in winter, then cast the seed, then cover with wood chips. The first project day I couldn't cover as much ground as I had seeded due to time and energy levels (I was only recently on my feet after my second round of the flu this season.) Once I had a chance to return to the pasture today all of the uncovered seeds were gone except for the vetch which resembles a small pea. So I reseeded in smaller portions and managed to spread an additional seven wheelbarrow loads full. A lot of area yet to be seeded! Once the seeded portion is strong enough for occasional grazing we'll allow the goats into portions of the pasture at a time. I'm keeping an eye on CraigsList for fencing and gates so we can create those areas. One thing the lecturer emphasized was only allowing your animals to eat the plants down to about two inches and not any lower otherwise you risk the plant dying. However, If you don't allow the plants to be "harvested" they will get to a certain size and stall in their growth. Apparently you will get maximum forage from each plant if you keep cutting it down to between two and three inches then letting them grow for a week or so. I enjoyed working outside, getting dirty, and sweating but doing all this by hand is a lot of work! But I am oh-so-excited to see what happens this year and next! On a related note, I'm listing our two weathers on Craigslist soon. Are any of you interested before I post them there? They are Nubian and Boer cross, hand fed, 10 months old. $75 a piece or $125 for both. They are friendly and silly and will either make good pets or delicious meals. 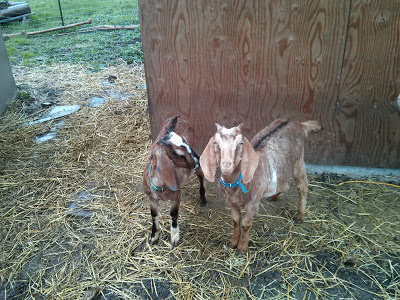 Goats are very social and will be very unhappy alone. 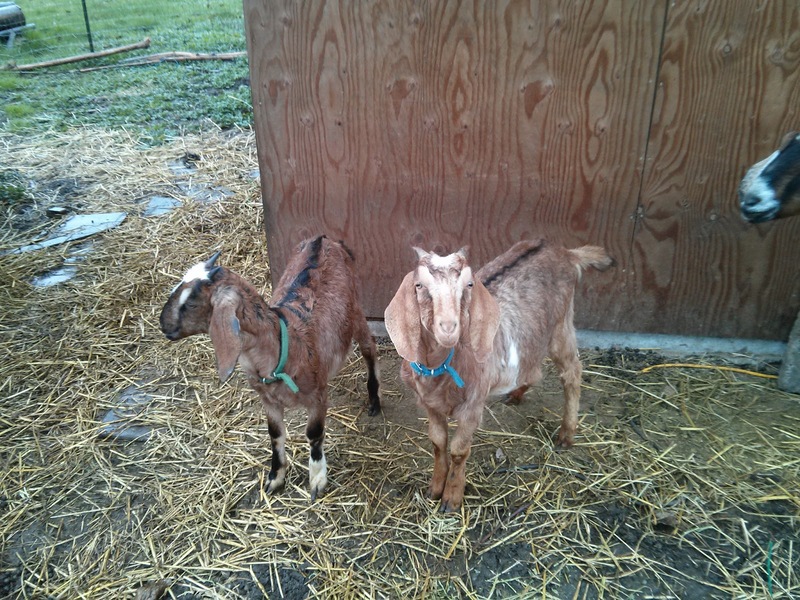 Prefer to sell them together but will sell individually if you already have companions like other goats, sheep, or horses.